My Grandmother’s Kitchen – Flogging Delicious! As much as I love eating out and trying new restaurants in a city like London, where I am so spoilt for choice every day, there is a lot to be said for home-cooked food and the comfort that this can bring. For me, it is a reminder of family and the many occasions in which we have gathered round the dinner table to celebrate, to relax, to laugh and to joke. Growing up, I particularly loved spending time at my grandparents’ house, running round in the garden, or sitting with my grandfather and playing games on rainy days. But what I loved most of all was watching my grandmother work in the kitchen, creating the dishes that had been passed down to my mother and that had become an integral part of family life. I loved being given special tasks to complete, like squeezing the lemons for our daily salad or peeling some cloves of garlic to be added to the cooking. I relished the responsibility of getting involved in something that my maternal family figures took so much pride in. Today, my grandmother lives in a beautiful mountainous region about half an hour away from Beirut, Lebanon’s capital city. For her, being back in a country that boasts all the amazing ingredients that grace her dishes is incredibly important, because they provide a real representation of how food should taste. It was therefore with great excitement that I visited my grandmother in the spring of this year, when my all time favourite dish, Warak Enab, had its main ingredient ready to be collected and turned into something absolutely wonderful. 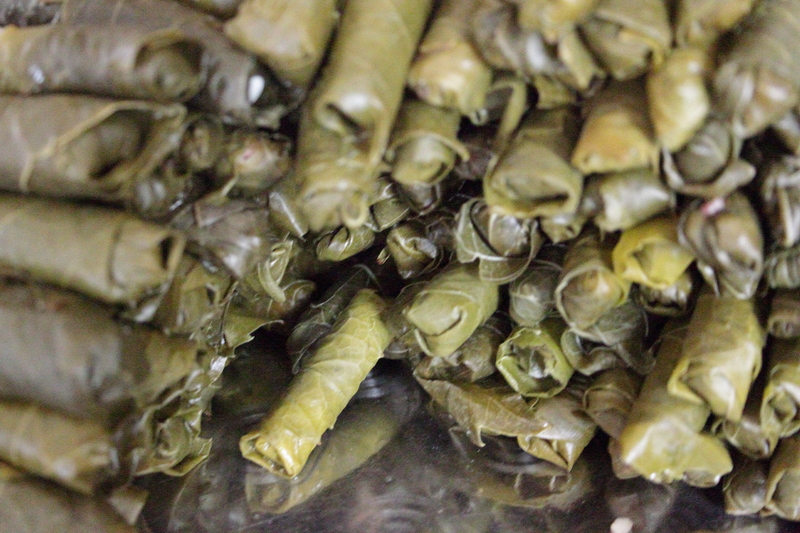 Warak Enab, or Grape Leaves, picked young and fresh straight off their trees, stuffed with minced lamb and rice and cooked with plenty of lemon and garlic, provide an enjoyment in my family that is difficult to describe. This dish is definitely a labour of love, and one in which my grandmother has excelled and exhibited tremendous patience. Her fingers are simply magic, working deftly to create her signature miniature stuffed leaves that are the envy of many. I remember sitting with her as a child, being taught the careful technique under her watchful eye, being cautious not to overfill my leaves or to be too aggressive with them, but making sure they were rolled just tight enough. 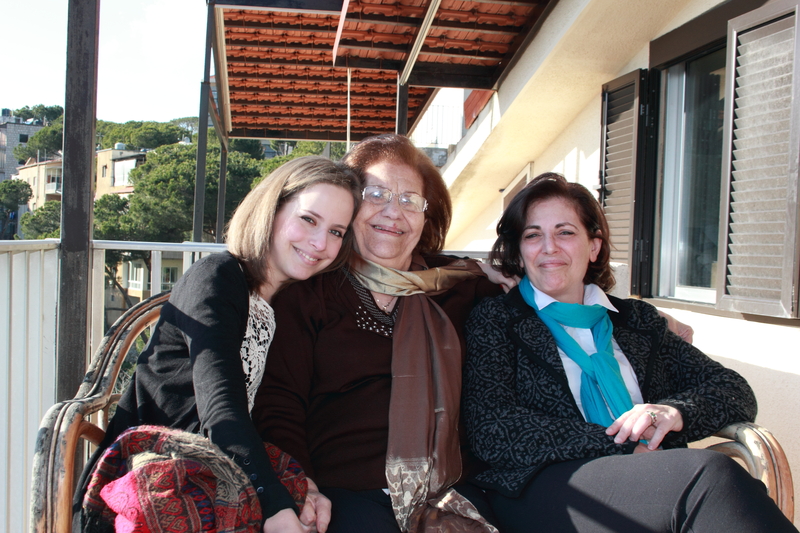 It was with great enjoyment and nostalgia that I was able to sit with her once more and to help create this favoured meal, three generations of women (my mother included), working together on a sunny Lebanese morning on her balcony, exchanging stories while watching as the piles of rolled leaves were stacked ever higher. With our hard work done, the only thing to do now was to wait patiently, savouring the smells that wafted out of my grandmother’s kitchen, engulfing the whole house. Putting the final touches on the meal, we waited with bated breath for that show stopping moment when the leaves are swiftly turned out of the pot and reign supreme on the dining table. What better way to say ‘welcome home’ than that very moment, my family members and I gathered once more around the kitchen table, ready to scoop up some grape leaves in bread and to dig in? 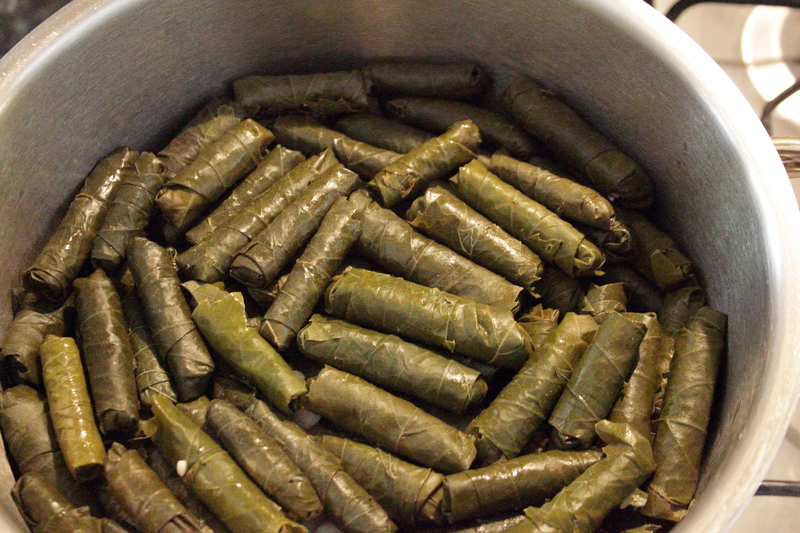 You will also need a small plate and a heavy stone to keep your vine leaves from floating up during cooking. If you can’t get your hands on fresh grape leaves, they are easy to find in jars soaked in brine, which are available in Mediterranean and Middle Eastern shops. 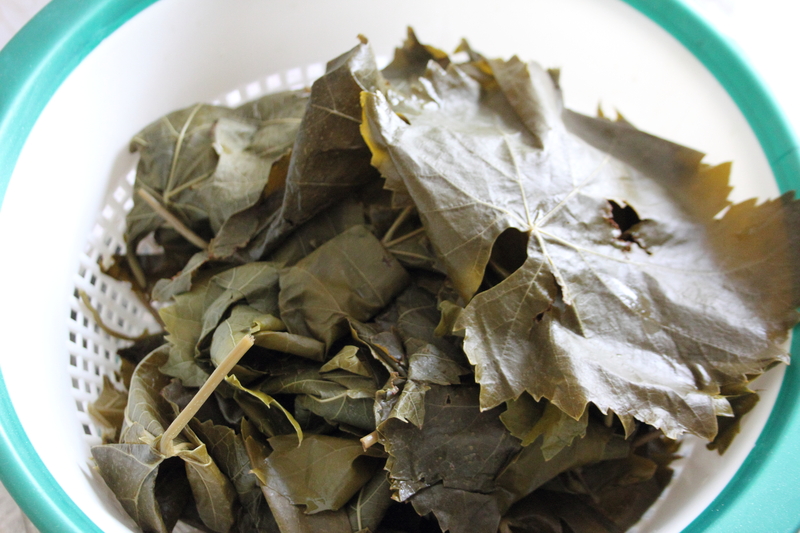 Leaves need to be immersed in boiling water for about 30 seconds, then placed in cold water to cool them down and, if using jarred leaves, to remove any residual salt. To make the stuffing, combine the rice, salt, pepper, cinnamon and meat in a bowl, using your hands to mix the ingredients in well. Trust your eye on this, you don’t want too much meat in any one roll as this is more of a rice dish. On a clean work surface, place each leaf with the top facing away from you and the veined side facing up. Cut away any remaining stalks and place a generous teaspoon of filling into the lower-middle of your leaf, moulding it into the shape of a small, compact finger of rice filling. Carefully begin to fold the bottom of the leaf upwards, tightly around the filling, bringing in the sides of the leaf as you continue, finishing by rolling the remainder of the leaf upwards until sealed. In a large heavy set pot, add your cooking oil, line your lamb chops at the base and pack tightly. Turn on your heat and fry gently on both sides with some salt and pepper until nicely brown, adding your butter a few minutes in and coating the lamb well. Turn off the heat and add your stuffed vine leaves into the pot to make rounds, working horizontally and then vertically until you’ve used up all your leaves. Make sure to have the opening of the stuffed leaves facing down so that they do not come loose, and pack a few cloves of garlic into each row before moving onto the next. Season your top row with salt and pepper and fill the pot with hot water until your contents is covered by about 1 cm. 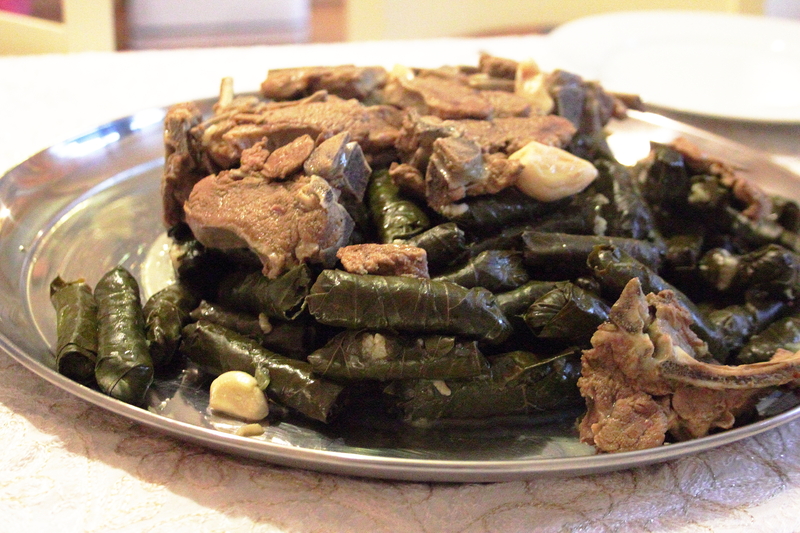 Grab your plate and place it face down on top of the vine leaves, pressing down gently, and place a heavy stone on top. Turn the heat back onto high and boil the leaves for a good ten minutes, before turning the heat right down and simmering. You need to make sure to keep an eye on the pot – if you see that the water is running low, top it up until the contents is covered once more. After all, what makes this dish so delicious is its juiciness and sauce. After 30 minutes, squeeze in the juice of 3 lemons and continue to cook for a further 45-60 minutes, until the vine leaves are tender and the rice is cooked. To serve, carefully tip any remaining sauce into a serving bowl. Now, carefully place a large, round, flat serving dish on top of your pot, face down, and in one quick action, flip your pot over, to turn out your leaves. Serve with natural yoghurt, the remaining grape leaf juices, and bread (khobz markouk is best), if you wish.